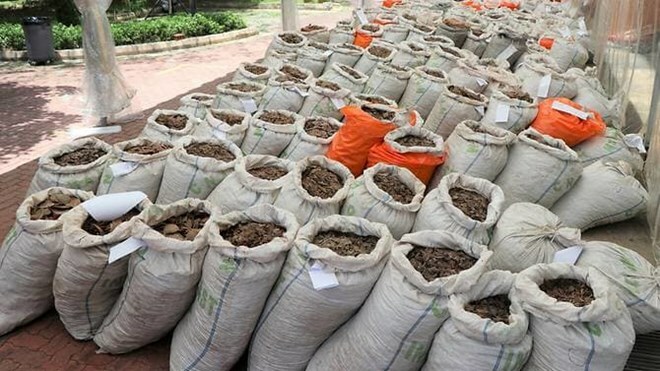 Singapore (VNA) – Singaporean authorities have seized nearly 13 tonnes of pangolin scales worth about 38.7 million USD, which is the biggest single haul globally in recent years. According to the local media, around 17,000 pangolins were killed to make up the shipment. Following an inspection of the 40-ft container by the National Parks Board (NParks) and Singapore Customs, the 12.9 tonnes of scales were found packed in 230 bags hidden among packs of frozen meat from Nigeria and bound to a Southeast Asian country. The container, declared to contain “frozen beef”, also included 177kg of cut up and carved elephant ivory with an estimated worth of 88,500 USD. If convicted of illegal import, export, and re-export of wildlife, an offender can be fined a maximum of 500,000 SGD (about 369,375 USD) or two years in jail, or both.